The new Hotel de Tourrel combines a French region’s rich history with a contemporary touch. Throughout history art world giants, culinary pioneers, and enigmatic personalities have all been lured to the hilltop villages of Provence. Home to lavender-scented breezes and the idyllic Mediterranean sun, it’s also a region with contrasting narratives. In the Côte d’Azur, Julia Child and James Beard reinvented American cuisine in the summer of 1970; now it’s a playground for the A-list, with a glamorous film festival and mega yachts plying the French Riviera. On the western side of Les Alpilles, near Avignon, Saint-Rémy-de-Provence is the antithesis of flashy. Not only the birthplace of French seer Nostradamus, it’s also where Van Gogh found inspiration for his 1889 painting “The Starry Night.” Situated among home-décor shops and boutiques is the new Hotel de Tourrel, a 17th-century palais in the heart of the old village. It, too, has a storied past, home to an aristocratic family whose patriarch was a cavalier in service of the king. “You can feel a cool, timeless, and noble elegance in every corner of the house and its facade,” says architect owner Margot Stängle, who scoured the country for two years with partner Ralph Hüsgen before discovering the property. She found some of the spaces in rough condition, including the floors, which had to be restored with locally sourced sandstone. “It was customary in that time to ride a horse to the first floor,” Stängle says, which helps explain the spacious dimensions of the grand staircase. She tripped over other tidbits along the way, for instance, discovering that Charles Gounod’s opera Mireille was first performed in the building’s salon in 1864—providing inspiration for the hotel’s chandelier crafted from organ pipes. How do you speak a modern design language with old materials? Stängle grappled with that question while reimagining the main stone manor. “It was important to me that if you go through the building, you have smooth transitions between old and new,” Stängle says. She chose ClassiCon to outfit each of the airy, individually designed rooms. In the five restored suites, she discovered stucco underneath the chipped-paint walls, so she hired plasterers from Breslau, Poland, to rehabilitate it using traditional methods. Next she took to reviving original décor elements such as French herringbone parquet floors, Carrera marble bathrooms, and Renaissance-era beamed ceilings. The custom midcentury furnishings—Roquebrune chairs, Lota sofas, Menton tables—are by Eileen Gray. The two modern suites, located in the adjacent house, are bedecked with pieces by Konstantin Grcic and Jader Almeida. 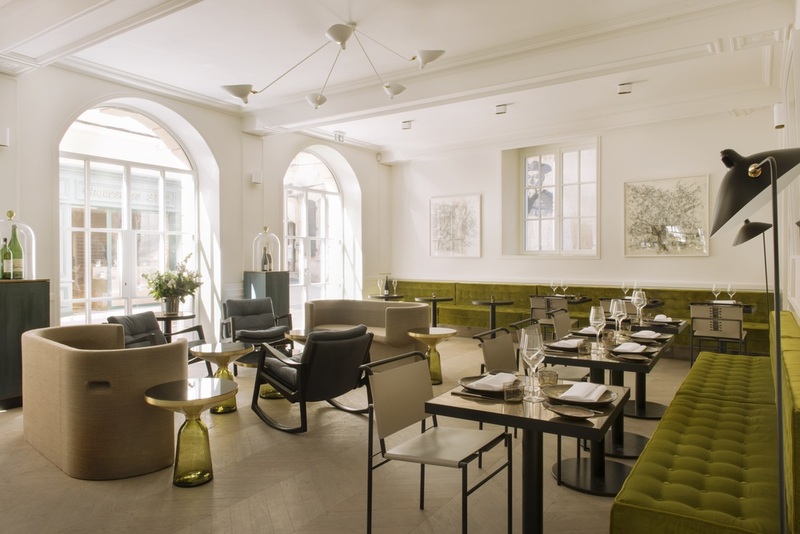 Artificially aged brass was chosen for the nouveau Mediterranean restaurant (crab cannelloni; crispy lamb shoulder with tomato confit and local dates), helmed by chef Benoit Fauci of the Michelin-starred Les Chênes Verts in Tourtour. The space’s streamlined color scheme alludes subtly to its location: Pea-hued sofas recall the region’s famous olive oil while grayish navy tones resemble Van Gogh’s paintings. (The artist composed over 100 works in Saint Rémy.) For the bar, she tapped a local carpenter to create a zinc surface using old techniques, then hired an artist to varnish it with varying shades of blue that change in the light. Serge Mouille lamps sit under fruit tree paintings on loan from a local artist; look closely, and “you can see women’s faces in them,” she says. The wine cellar, housed in a Roman barrel vault, is stocked with over 350 biodynamic varietals chosen by Hüsgen. The theme of old and new oscillates throughout the hotel’s interiors. “With its wonderful basis, the building gave us the possibility to combine historical architecture with uncompromisingly modern architecture in an unagitated way,” Stängle says. What better illustration than the sleek rooftop pool—the only one in town—surrounded by the ancient walls and historic towers of Saint Rémy. Nate Storey is the associate travel editor at Surface.